PediaSure Harvest is complete nutrition in a real-food blend made with organic fruits, vegetables, and grains. It can help meet energy requirements of children ages 1-13 years who have inadequate oral intake and need nutrition support for normal growth and development. Meets or exceeds 100% of the Dietary Reference Intakes (DRIs) for protein and 25 vitamins and minerals for children ages 1-8 years in 1000 mL, and for children ages 9-13 years in 1500 mL. Provides a good source of antioxidants*. Fiber from a blend of whole foods. For oral or tube-feeding. Not for IV use. Not intended for infants under 1 year of age. Use under medical supervision. * Vitamins C, E, and selenium. PediaSure Harvest is not available in California. Water, Organic Banana Puree, Organic Spinach Puree, Organic Milled Whole Grain Brown Rice, Organic Mango Puree, Organic Broccoli Puree, Organic Pumpkin Puree, Organic Rice Maltodextrin, Soy Oil, Soy Protein Isolate, High Oleic Safflower Oil, Organic Carrot Juice Concentrate, Organic Rice Protein Concentrate, Chicken Broth. Less than 0.5% of: Soy Lecithin, Tuna Oil, L-Lysine, Taurine, L-Carnitine, Calcium Phosphate, Potassium Chloride, Potassium Hydroxide, Ascorbic Acid, Choline Chloride, Ferrous Sulfate, dl-Alpha-Tocopheryl Acetate, Zinc Sulfate, Niacinamide, Calcium Pantothenate, Thiamine Hydrochloride, Biotin, Pyridoxine Hydrochloride, Riboflavin, Vitamin B12, Vitamin D3, Folic Acid, and Potassium Iodide. 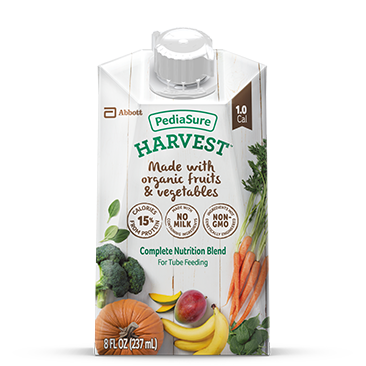 PediaSure Harvest™ 1.0 Cal is a complete nutrition blend tube-feeding formula for children ages 1-13 that includes a variety of organic fruits, vegetables, and grains, including banana, spinach, mango, broccoli, pumpkin, and carrot. What are the indications for PediaSure Harvest use? PediaSure Harvest can help meet energy requirements of pediatric patients ages 1-13 who have inadequate oral intake, and need enteral nutrition support for normal growth and development via tube-feeding. PediaSure Harvest can be used as sole source or supplemental nutrition. What are the age requirements for PediaSure Harvest? What is the standard caloric density? PediaSure Harvest is a nutritionally complete formula designed for children 1-13 years of age. PediaSure Harvest provides 1cal/ml standard caloric density.